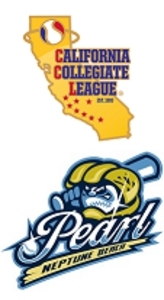 The Pearl have completed the 2015 regular season and are now ready to head back south to San Luis Obispo for the 2015 California Collegiate League Playoffs. The playoff tournament will take place Friday July 31st - Sunday August 2nd at Sinsheimer Park in San Luis Obispo. The Pearl head to the playoffs as the CCL North Division Champions and the #1 seed for the tournament posting a 17-8 CCL League Record. Playoff seeding is based on highest league winning percentage and the Pearl finished with a .680 Winning Percentage. The Pearl finished the regular season with a 33-16 Overall Record. The #2 Seed is the South Divison Champion Conejo Oaks. #3 Seed the Wild Card Winner San Luis Obisipo. #4 Seed South Champion Los Angeles Brewers. Schedule for the Double Elimination playoffs below. Follow at the action live on the Pearl Twitter Feed. We will tweet links to live video and radio broadcast.